This is the first in a series of three essays intended to critique selected aspects of the prevailing modern worldview of the West’s ubiquitous liberal regime. In the present essay, I am interested in the prevailing modern view of education; I argue that various pre-modern ways of understanding education address their topic with a good deal more penetration than that achieved by the modern view, which tends to insipidity. In a follow-on essay to this one I will address the question how revelation is related to reality; a third essay will devote itself to a discussion of memory considered as an institution. The one thing that modern educators, including modern college and university educators, know best is that faith has no place in education. Faith, the term by which modern educators, when they use it, invariably mean Christianity, is, in the prevailing view, inimical to education – a “clinging” bogey to be banished. At the institution where I teach, a mid-tier state college in the Northeast, official edicts have banished all signs of Easter and Christmas, substituting for the latter the bland notion of “Winter Holidays.” In December, the president annually sends all faculty and staff a calculatedly inoffensive “Winter Holidays” greeting, via email. For what it is worth, for many years I have regularly received an unambiguous “Merry Christmas” message from a long-distance colleague at the University of Tehran, under the auspices of whose department I had the good fortune, a few years ago, to chair a dissertation. That modern higher education implacably execrates Western Civilization, which gave birth to it in the Eleventh Century, is a well-established phenomenon. I would argue, however, that modern higher education’s hostility to Western Civilization is a secondary phenomenon and that the primary phenomenon must be modern education’s hostility to the religious foundations, whether Pagan or Christian, on which Western Civilization arose and, until recently, based itself. Modern higher education since the Eighteenth Century has been resolutely rational, taking natural science, especially physics, as its model of epistemological correctness, and setting itself vehemently against anything that refuses to conform itself to that model. The mental posture of the representative modern faculty member is that of the encyclopédistes – nothing not in the encyclopedia counts as knowledge and only what is in the encyclopedia counts as real. If I proposed that the intellectual confusion of modern education, including modern higher education, was directly related to its self-conception of existing within a cordon sanitaire that protects it from contamination by what it regards as irrationality or superstition, I would approach my thesis: That when higher education – or any phase of education – repudiates faith it repudiates its own character, the structure of education being identical with the structure of faith. That North America’s institutions of higher education began as seminaries for one splinter-group of Protestantism or another belongs to the thesis, but is by no means identical with it. Modern higher education is far narrower than any Nineteenth-Century seminary education: It instructs and the content of its instruction is implacable doctrine. For example, when it teaches what it pretentiously calls critical thinking, nothing that issues from such “thinking” is not known in advance either by the instructors or those whom they instruct. In faith, by contrast, nothing is known with certainty in advance because faith is not a syllogism, which is merely a tool for assessing the validity of premises. Faith is a leap into itself, which is to say, it is a leap into experience in quest of truth. The phrase “a leap into faith” originates with the Danish philosopher and writer Søren Kierkegaard (1813 – 1855) who, in the Philosophical Fragments (1841), responding to the algorithmic rationality of the arch-university professor G. W. F. Hegel, wrote, in theological terms, of the “Paradox” (always in the Fragments capitalized) of the teacher-learner relation, and of the additional relation between “passion” and “discipleship.” Kierkegaard delighted in paradox. His delight stemmed from his intuition that the human reality or consciousness – or culture – is essentially paradoxical. Consciousness – or culture – is something that resists any reduction to a syllogism because while it must be acquired, for otherwise the subject never rises above savagery or infancy, it cannot justify or explain itself in advance. At most faith might be said to beckon plausibly, which is why faith is sometimes called a response to Grace or a vocation. Kierkegaard is discussing religion. He writes in the Fragments how the existing person finds redemption in opening himself to the conversion-experience, so central to Christianity, which delivers the person from his complacency into a new poignant consciousness, the result of which is to endow experience with order. Despite the modern conviction that religious experience can have nothing to do with education, Kierkegaard’s discussion of religious experience will prove on inspection to have everything to do with education, especially higher education. To repeat my thesis: The structure of education is the structure of faith. Before exploring further Kierkegaard’s analysis of the relation between faith and experience, and of the relevance of these phenomena to education, and of education to truth, it will be profitable to remind ourselves of the positions of modern educators on the items of the philosopher’s essential vocabulary. Take truth. Modern education, most especially modern higher education, dominated as it is by a dogmatic relativism, denies that there can be such a thing as truth. Modern education insists that there are only perceptions or interpretations and that none of these can be resolved into a metaphysically incontrovertible certainty. The most that people can do is reconstruct the lifeworlds of other parties, as in ethnography. This argument, the foundation of the whole so-called multicultural curriculum and of the project of so-called diversity that accompanies multiculturalism, is itself paradoxical; but unlike Kierkegaard’s “Paradox” it is only paradoxical in a trivial and self-deconstructing way. Denying truth, it nevertheless presents itself as an incontrovertible certainty, that is, as a truth. It admits no uncertainty in respect of its truth. In so doing, the doctrine contradicts its own commitment to the relativism that it sacralizes. Practically, dogmatic multicultural relativism must make endless exceptions to and compromises with its own infallibility, and it does, to the grim amusement of ironic onlookers. Take the concepts of knowledge and ignorance. Modern educators, who claim special knowledge not possessed by ordinary people, land themselves in another contradiction when they avoid the concept of ignorance, as frequently they do. An Internet-search of the phrase “learning from students” will reveal modern education’s obsession with the idea that students have special profound knowledge prior to instruction that their teachers lack and that a main job of teachers is “learning from students.” Did the instructor not have that same knowledge when he was himself a student, before he became an instructor? Then how can he not still have it? Why must he learn it? By corollary, modern educators hesitate to identify the lack of knowledge or the failure to acquire it, when either of these things appears – hence the increasing worries, in educationist palaver, about “grade disparity.” When the instruments of assessment show that the student has not learned the material, modern educators claim that the student must have learned it and that the instrument of assessment must be in error. Modern education avails itself inveterately of such rhetorical dodges, which it requires in order to conceal the differences that offend its commitment to equality in everything and its proposition that there is no such thing as truth. Of course, if there were no such thing as truth, there could be no such thing as knowledge. If there were no truth, there would be nothing but error and confusion. There would be nothing for the instruments to measure. And so, operationally, it is! Kierkegaard understands that the predicament of the learner entails a paradox – and in no trivial way. The capitalized “Paradox” stems from the difference – that is, the absolute incommensurability – between ignorance and knowledge, ignorance being where the learner necessarily begins and knowledge being where he wants to end so that, beginning again, he might conduct the search for truth on his own. Yet, beginning in ignorance, the learner cannot, in fact, know what it is that he wants; but at most he can incoherently want, which is the same thing as his ignorance, his want or lack of knowledge. The learner requires the teacher – Kierkegaard takes as his teacherly exemplars Socrates and Christ – to vouchsafe the necessity of making a movement towards the goal, no notion of which can the learner yet form based on his own experience. The beginner has no experience. This movement, which the learner cannot justify to himself, and which no one can justify to him, necessarily amounts to a leap into the unknown. As such, it differs not at all from the “leap into faith.” The structure of education is the structure of faith. Elsewhere than in the Fragments, Kierkegaard articulates the “Paradox” in existential rather than theological terms. In his Journals (Hannay’s translation) from 1843, Kierkegaard writes: “It is quite true what philosophy says; that life must be understood backwards.” Kierkegaard immediately adds, “But then one forgets the other principle: That it must be lived forwards.” In Kierkegaard’s formula, living one’s life resembles reading a book, which one also can only undertake “forwards” but which one can only ever understand by looking “backwards.” Life, like reading or education, the former belonging integrally to the latter since the alphabetization of Greece, demands to be lived as though it were a wager, whose outcome remains unknown. Bureaucrats never grasp this: They live by “mission statements” and “five-year plans.” Novelists understand Kierkegaard, even the Twentieth-Century ones. What ultra-confident novelistic protagonist avoids the smash-up of his sure thing? Complications only increase. The unique place of repose from which the subject might contemplate his whole life “backwards,” thus obviating the wager, is a hypothetical status beyond his death. Only in his death will his life find completion unless as some people aver there is a realm beyond mortality. 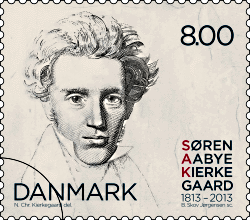 As Kierkegaard writes in the continuation of his journal entry: “The more one thinks [the principle] through, [the more one] ends exactly with the thought that temporal life can never properly be understood… because I can at no instant find complete rest in which to adopt a position: backwards.” (Kierkegaard’s “I” refers to the subject generally.) How to resolve the aporia? What can the subject study “backwards”? He can study the completed lives of his precursors and predecessors. He can study the past, and by so doing make it his past. Here again, modern education, including higher education, ill-serves learners. Modern education, including modern higher education, not only denies the existence of truth while obfuscating the difference between ignorance and knowledge; it also rejects the past as unworthy of study except in limited, prescriptive ways, as an object of ridicule or execration. The English departments of the USA’s colleges and universities now focus almost entirely on contemporary rather than historical material – one may graduate with a baccalaureate in English Literature from numerous colleges and universities without having read Chaucer, Shakespeare, George Eliot, or Henry James, all of whom have become optional where they have not disappeared altogether from the reading-list. The professoriate now teaches history as an exercise in the rhetoric of righteous indignation, as though the record of human experience was the leftwing mirror-image of an Ayn Rand novel. The instructor teaches the student to repudiate the past. For evidence, see any paragraph by the late Howard Zinn. Modern education, including modern higher education, isolates itself from the past defensively in order to assuage its inability to tolerate contradiction. Because the ancient and medieval dispensations contradict the modern dispensation, the modern dispensation cannot tolerate them. Modern educators abide in absolute certainty of themselves, even though they have not yet completed their lives, and can have no sure basis for their passionate self-conviction. Modern education, including modern higher education, edits and suppresses its precursor-dispensations. The medieval Christian dispensation by contrast gladly accepted much from its precursor Pagan dispensation despite the tensions. Even more, modern education, like everything else modern, is “progressive.” It anticipates the radiant future, the expected vindication of its intransigence, which is to say, it can only think forwards. But thinking forwards comes close to being a contradiction in terms unless it bases itself on the prior mastery of thinking backwards. Note however that this thinking forwards based on thinking backwards will be thinking by analogy. Note also that the modern phase of enlightenment denies the argumentative validity of analogy. A side-note: The modern aversion to analogical thinking stems from the fact that analogy deals with likeness whereas modernity prefers to notice differences, to which it habitually defers; modernity feels uncomfortable with analogy because in analogy the thinker compares one thing with another, threatening the principle of equality or equivalency. The very term “higher” implies the necessity of a leap, not a step from the rung below to the rung above, but a voltige from the ground en pleine aire. A leap, be it noted, is unlike a ladder, in the same qualitative way as a ladder is like a syllogism, the propositional basis of reductively logical discourse. Between the first and the third rung there is always the second rung and there is always a top rung beyond which the climber cannot rise. Movement up the ladder is predetermined by the ladder. Modern instructional education is like a cybernetic program in which the immense ladder-like chain of if-then procedures although impressive and even baffling to layman always has a top rung beyond which it can produce no result. The ladder in this sense constitutes a limitation within the confines of which the student must remain. There is no transcendence; therefore there is no truth. There is a prohibition of questions; there is only a demand to follow-out an algorithm, and therefore again there is no truth. There is not even any life. Is there anything at all? Yes. There is the absolute homogeneity of thought, the strict conformism to a prescriptive set of opinions, which in modern institutions goes by the name of diversity. To repeat: The structure of education is the structure of faith. Consider, by way of illustration, the great pedagogical parable, Plato’s “Cave.” The story requires an event that cannot be explained: The periagoge or “turning-around.” Benjamin Jowett’s translation uses the passive voice to describe the unshackling of the prisoner: “When any of them is liberated and compelled suddenly to stand up and turn his neck round and walk and look towards the light, he will suffer sharp pains.” A bit later in the narrative, an “instructor” is present, but Plato does not explicitly make him the cause of the “turning-around.” What then is the cause? Kierkegaard would have understood that where the investigator can discern no cause, and in want of discernment falls back on the passive voice, the real cause will have been something spontaneous and unpredictable. Spontaneity is a rather technical-sounding term. Grace better designates the event. Indeed, the prisoner’s exposure to the light of the fire – that Amazing Grace – blinds and disorients him; suddenly, although inarticulately, he grasps the fact of his own ignorance. He had previously lived in total complacency, from which he has now emerged, but concerning any codification of which he requires the instructor’s aid. Indeed, the instructor only now attains his function. The instructor aids the ex-prisoner to articulate “the realities of which in his former state he had seen but the shadows” whereby the prisoner might come to terms with his own “clearer vision.” Only the experience of reality, however, can overcome the strong prejudice based on the habituation to complacency that “the shadows which he formerly saw are truer than the objects which are now shown to him.” The instructor encourages the ex-prisoner not to flag, but to open himself to reality, never stopping until he has emerged from the cave to experience the full light of the sun. The response to Grace is the leap, which the instructor validates even though the prisoner lacks the scheme into which he might receive an explanation of it. The instructor affirms to the ex-prisoner that the leap will carry him where he wants to go even though the goal, the surface-world in noonday incandescence and beyond it the astral cosmos, remains inexplicable and unjustifiable and indeed unimaginable until the prisoner reaches it. Between the bench where he was formerly shackled and his emergence from the cave stages intervene, it is true, but these graduations only become possible because of the leap. When the ex-prisoner – or the student – responds affirmatively to the instructor’s assurance that the goal will justify the leap, the student – or the prisoner – becomes a disciple. Faith and education absolutely require discipline. Modern education, including modern higher education, pretends that it can justify itself in advance. It cannot. The most it can do, given its repudiation of faith and indeed its repudiation of the very form of faith, is to sell programming to the applicant, who agrees to submit to it. Modern education, including modern higher education, sees the instructor as the efficient cause of the student’s education. Modern education, including modern higher education, sees the instructor as an efficient cause because it wishes to shape students in specific, limited ways, so as to offer to corporate employers a finished product that it can describe fully in advance and whose conformity to the description it can absolutely guarantee. Modern education, including modern higher education, has no transcendent element and therefore no relation to truth. It rejects the idea of a final cause because final causes are necessarily transcendent and teleological. Modern education still calls itself “education,” but when higher education – or any phase of education – repudiates faith it repudiates its own character as education, the structure of education being identical with the structure of faith. Submitted by marpag on Wed, 2015-04-29 16:27. I had been getting concerned from his previous articles that Mr. Bertonneau was disintegrating into a sociological mindset. Now, having read his latest offering, I am happy to see that his mind has been restored.